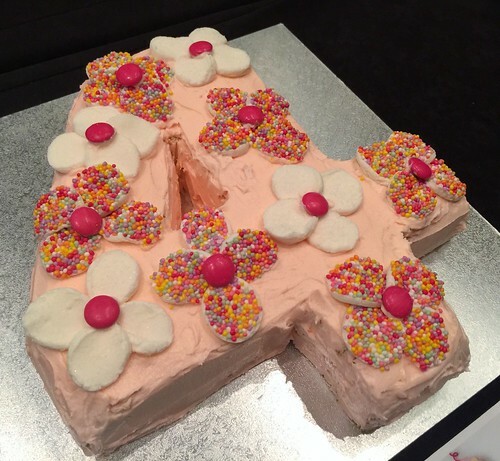 Over the eight years I wrote Melbourne Gastronome, I wrote several times about my love for the classic Australian Women's Weekly Children's Birthday Cake Book. 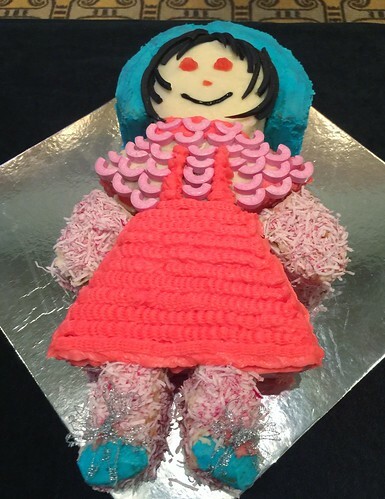 Waaay back in 2007 I wrote about the Facebook fan group I'd started, 'The Australian Women's Weekly Children's Birthday Cake Book is awesome', and in 2011 I wrote about the frabjous day when ACP decided to start reprinting the original book from the 80s. 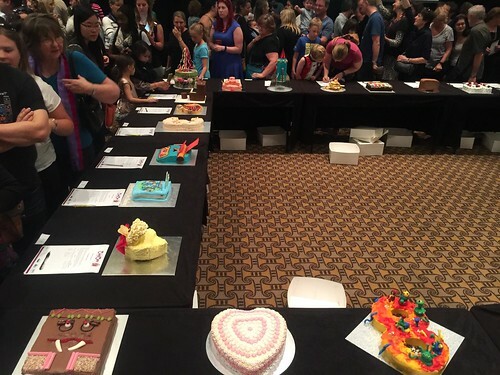 Well, on the weekend I had the pleasure of attending a fundraising event in Canberra at which all 107 cakes from the AWWCBCB were on display, baked by volunteers. 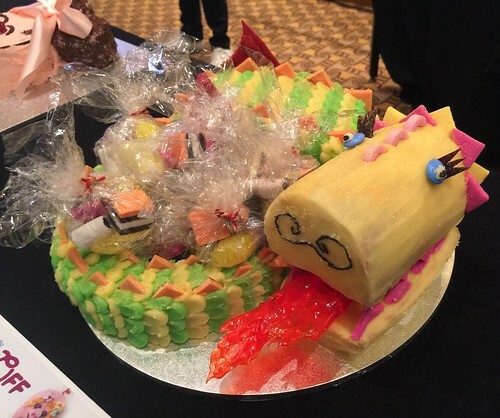 It was such a goshdarn DELIGHT that I was inspired to temporarily pull this blog out of retirement, to post a photo gallery of 43 of my favourite cakes from the event. Behold! 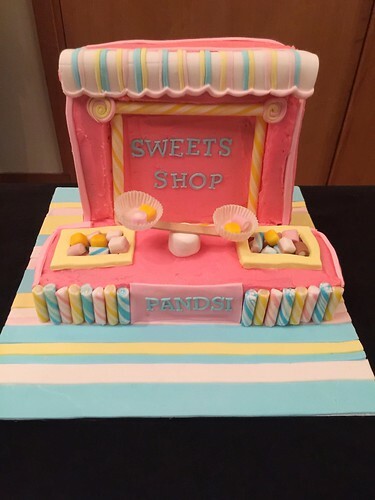 The event was the PANDSI Cake-Off. 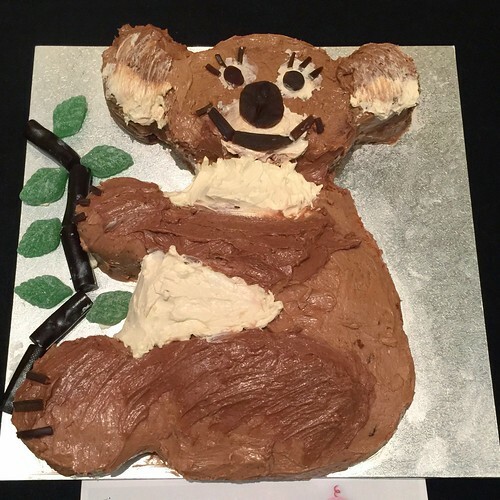 PANDSI is an ACT-based charitable organisation that does terrific work supporting mums and dads experiencing perinatal depression and/or anxiety. If you enjoy this gallery, please consider supporting this event and them by donating to their Go Fund Me account. 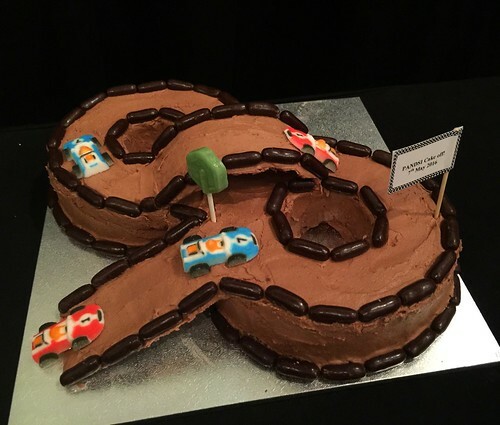 The Cake-Off was a huge success, exceeding their expectations and letting all of us relive our childhoods in a burst of 80s nostalgia. 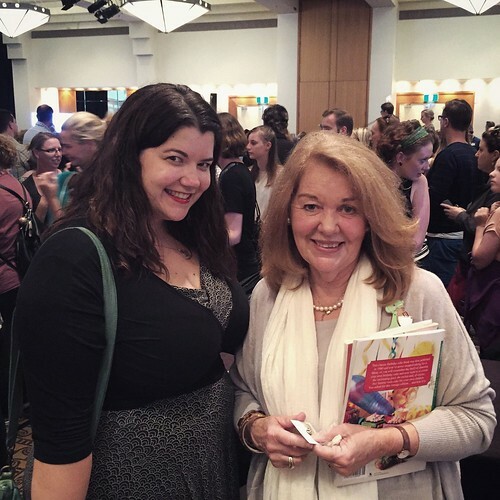 A highlight of the day was the presence of Pamela Clark (pictured right), editorial and food director of the Australian Women's Weekly Cookbooks. She was the chief home economist in the AWW test kitchen forty years ago, and the book was her idea! Pamela was gracious and lovely and I was completely starstuck to meet her. 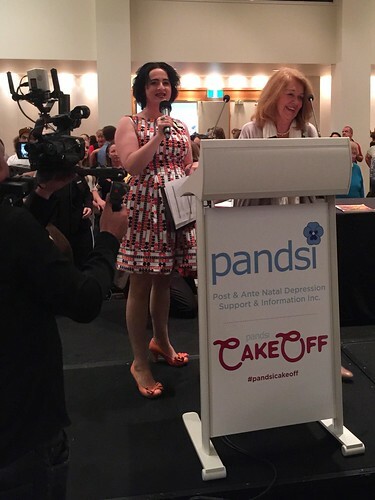 I also loved meeting PANDSI ambassador Ginger Gorman (pictured left), who came up with the idea for the Cake-Off and wrote a great article about it on news.com.au last week, and PANDSI president Christine Spicer. Smiley Shark here won the award for 'Most Closely Resembling the Original'. Love the Tic Tac teeth! 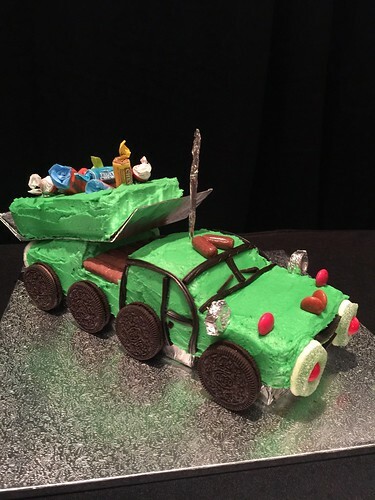 I was in awe of the tip truck cake. The tilted rear tray! The foil-covered head lamps! The biscuit wheels! 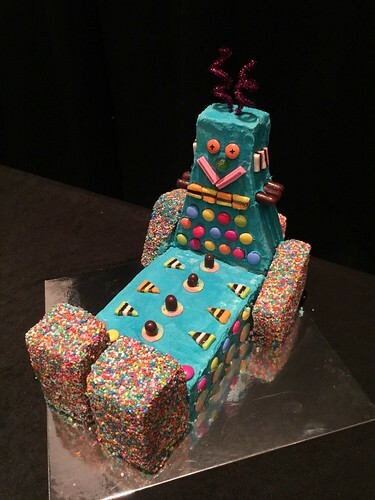 I was sorely tempted to bid on this one, but knew that the chances of getting the tilted tray back to Melbourne intact would be slim (not least because I'd be tempted to nick a few of the lollies). An equally impressive feat of structural engineering (and equally impractical for interstate transportation): the rocket ship. 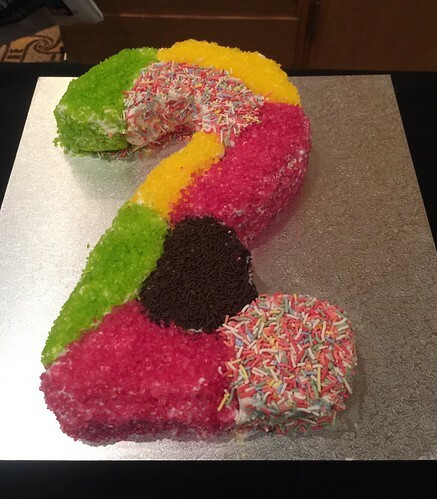 Excellent use of liquorice and party hat too. 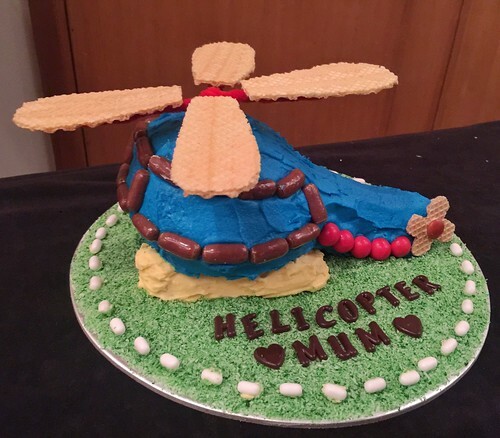 Actually, scratch what I said earlier: I think the helicopter is actually one of the hardest cakes to make. 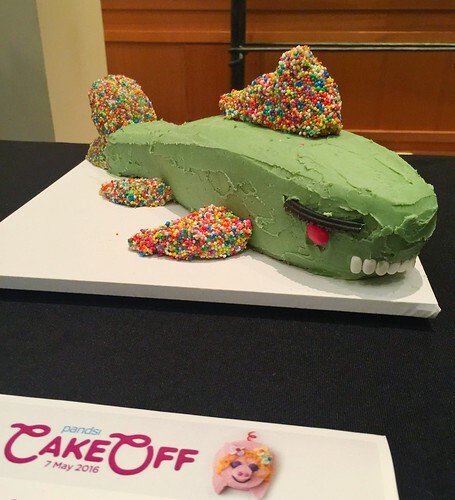 Even though the tail is resting on the ground I still think this volunteer baker did one heck of a job here (I love the wafer propellor and the 'Helicopter Mum' reference, heheheh). 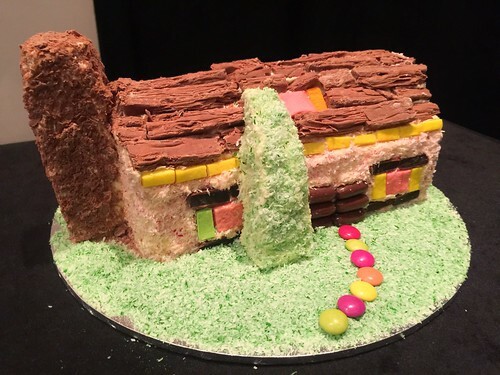 A++ faithful rendition of the castle cake, one of my favourites ever since Mum made it for me for my 6th birthday. JUST LOOK AT THE SMILE ON THIS ADORABLE DORK. I love him so. 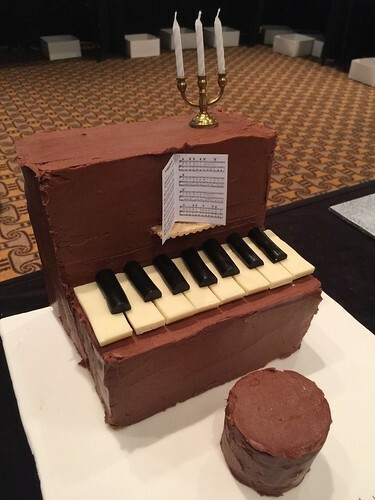 I have so much love for the piano cake too. 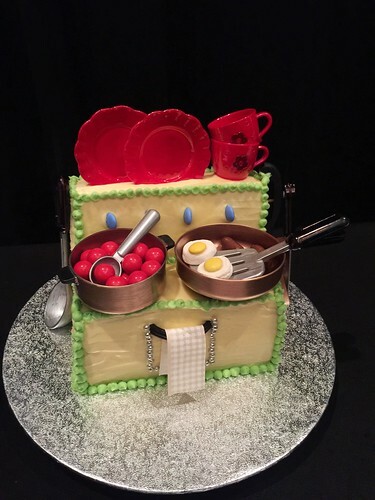 The volunteer baker who made this cake had to order the miniature candelabra from the US via eBay and visit about 12 candle shops before she found candles that fit. RESPECT. 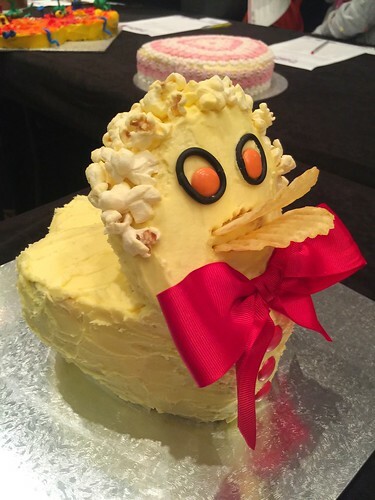 Duck cake! Everyone's favourite villain, he of the popcorn afro wig and salty chip beak. Another wonderfully faithful rendition, right down to the liquorice eyeliner and enormous daggy bow. The jelly 'water' in the swimming pool looked quite shallow, but it was a smart move on the baker's part methinks, given that it had to last all day. 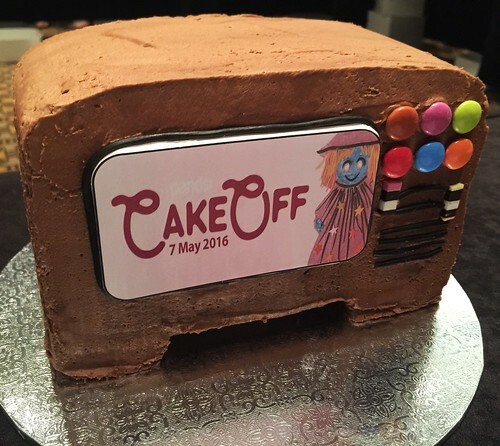 I liked that the television was very faithful to the original, but referenced the Cake-Off in the screen. 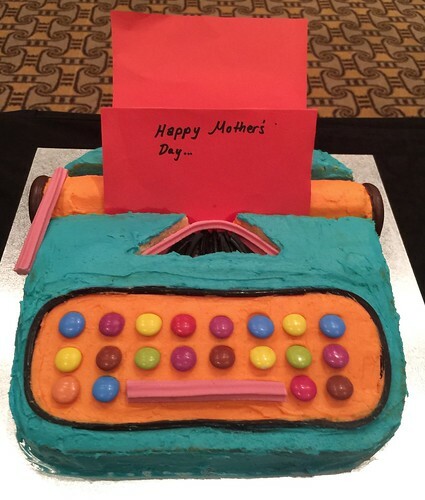 Another nice touch: the typewriter's text was changed to Happy Mother's Day, a nod to the fact that the Cake-Off was held the day before Mother's Day. Probably my favourite modernisation was the telephone - keeping the old but also referencing the new. Those iPhone icons! 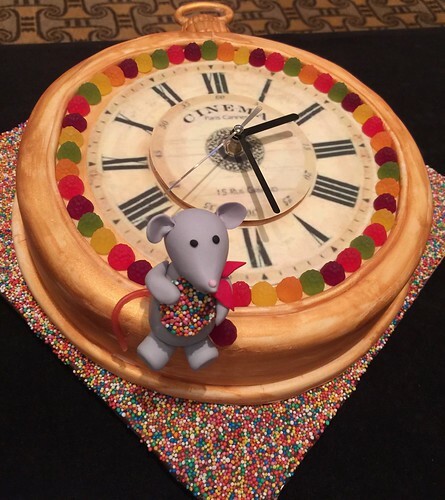 I'm kicking myself that I didn't take a video of it to show you the movement, but yes: that is an ACTUAL WORKING CLOCK in the hickory dickory dock cake. All the numbers were there, but the Two, Four and Six were my favourites. And how good is the racing track? Very nice work on the ramp and the bridge. Good ol' Leonard Lion and Timothy Tiger. 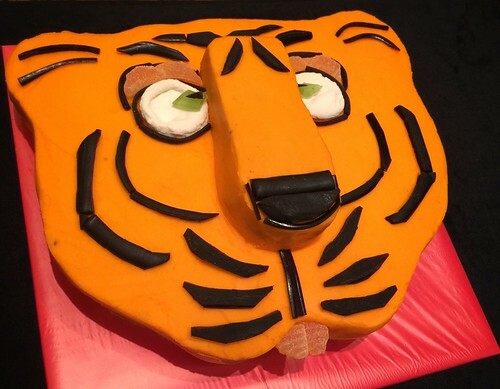 I love that these volunteer bakers kept them both cross-eyed, like they are in the book. 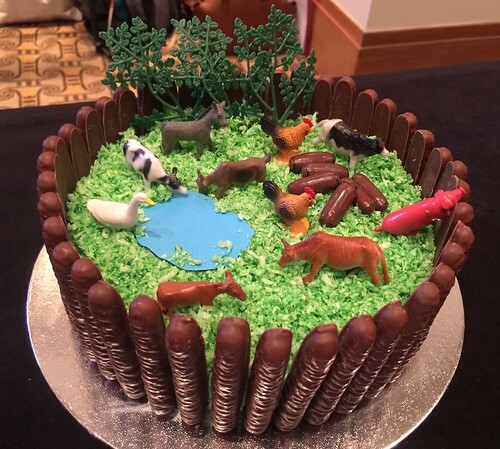 Great version of the farmyard cake. 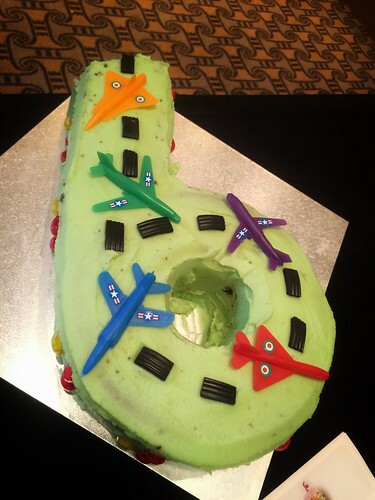 There were so many cakes with 'grass' on them, it's a wonder Canberra's supplies of green food dye and desiccated coconut didn't run out. 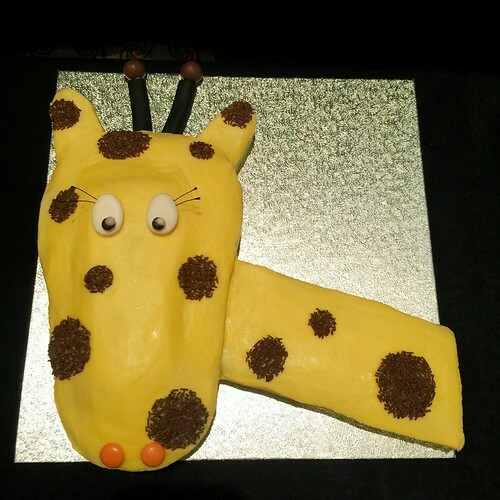 The giraffe has liquorice eyeliner in the book, but I covet this giraffe's dainty eyelashes. 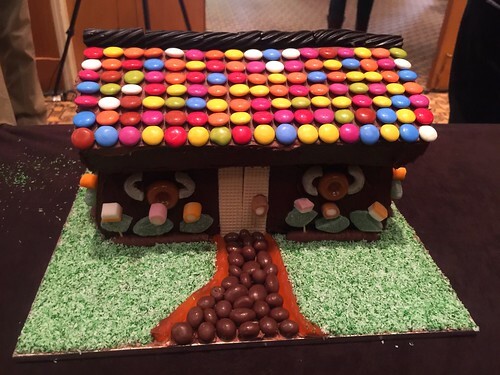 I remember lusting after both the gingerbread house and the log cabin as a child, mainly because I liked the idea of eating a roof made out of Smarties/Flake bars. More grass! 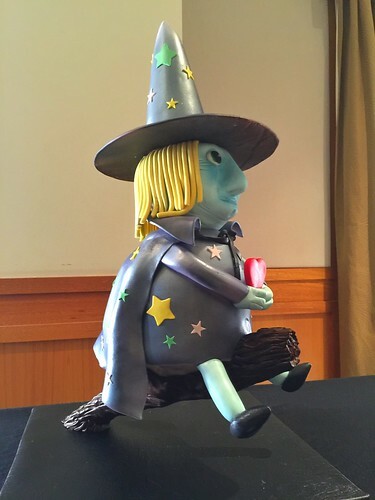 How sweet is the friendly witch. Y'know, the rubber ducky cops a lot of flak for his salty chip beak but I don't think we talk enough about the salty miniature french fry hair on this little lady. The 1980 tugboat gets a nod to 2016 with its Boaty McBoatface name. A beautifully rendered artist's palette, very faithful to the original. 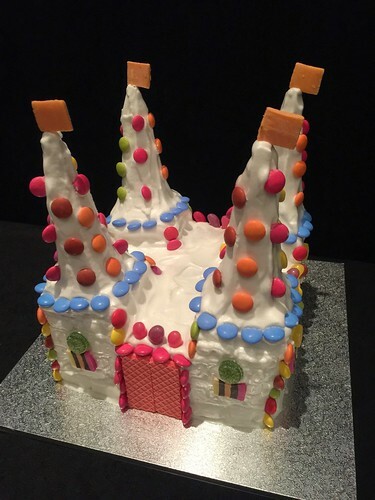 When I was a kid I always thought that all of the 'girly' cakes apart from the castle were boring, but it turns out the stove, sweet shop and ballerina cakes were some of my favourite ones to see on the weekend. Look at the level of detail on them! 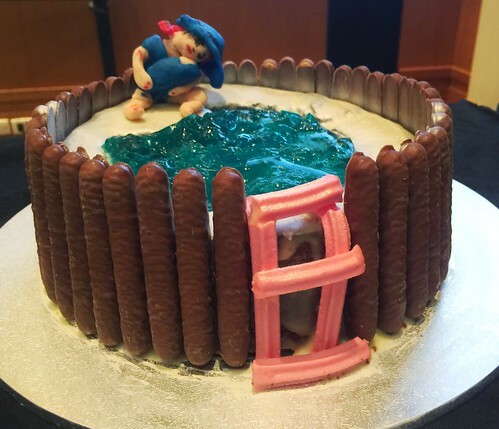 And normally I'm a bit of a fondant icing hater (sorry! I just think it tends to look unappetising and fake! 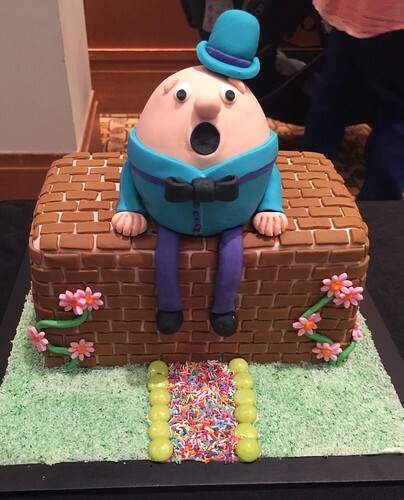 ), but these two sweet cakes won me over: aside from the hilarious expression on Humpty Dumpty's face, I like the way the fondant was integrated with non-fondant elements like the sprinkles, Smarties and grass. And I didn't get a good shot of the entire maypole, but this detail gives you a fair idea of what was involved - it was very pretty. 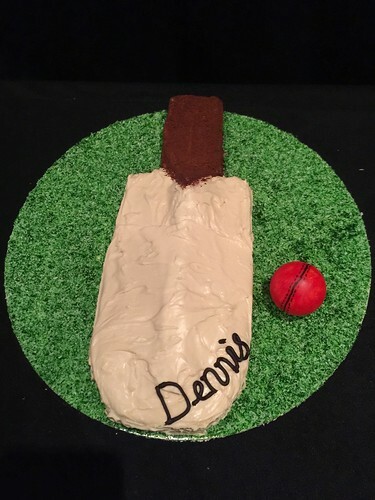 BLESS YOU, volunteer baker who made the cricket bat, for keeping the name 'Dennis' written in Modern Australian Cursive on the cake - just as it was in 1980. 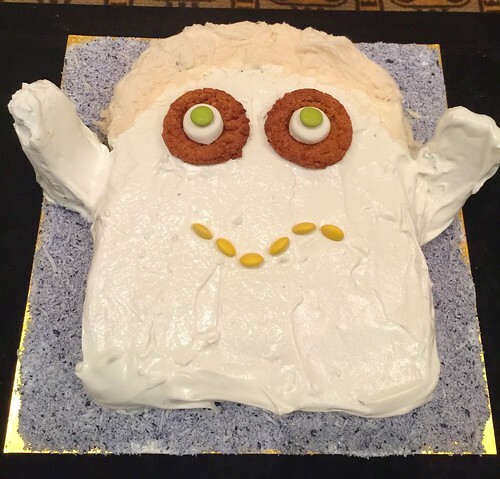 The friendly ghost of 2016 got a Persian fairy floss toupée, and his eyes were biscuits instead of the original egg shells (probably for the best, eh?). 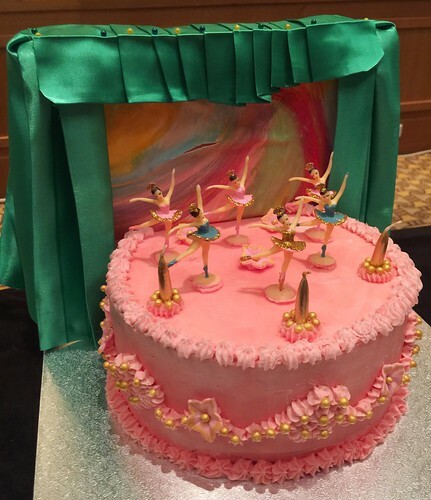 I'm really glad the volunteer bakers who made the dancing girl and Dolly Varden #2 went to the effort to reproduce the star tip icing dresses from the book - they both looked fabulous. 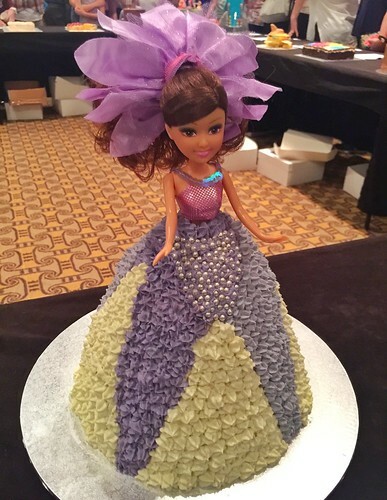 The Mary Jane dolly cake was sweet too - while she looked different to the one in the book, she felt very true to the spirit of the original cake. Great variety of textures. 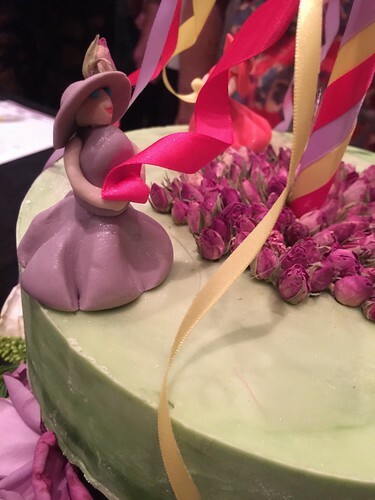 In the book, the dragon cake is basically just a head with party favours: I love that this volunteer baker gave the dragon a body, a fiery tongue and some rather coquettish eyelashes. 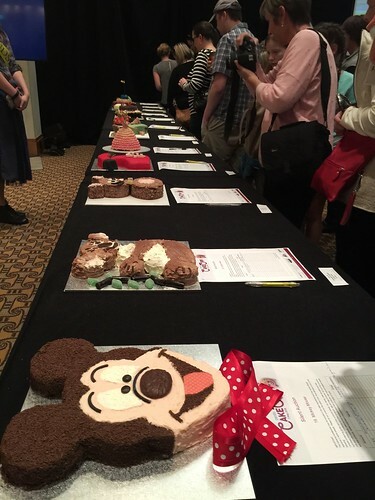 In addition to all the cakes made by amateur volunteer bakers, there were ten cakes made by professional bakers that were not part of the main competition, displayed in an adjoining room and sold in a live auction. 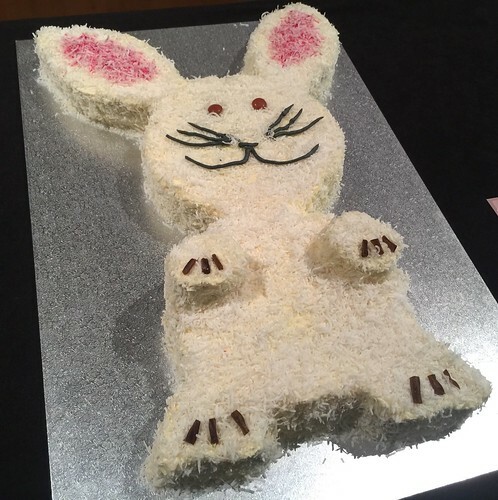 Pip & Lou made a simple, lovely version of the bunny rabbit cake, a personal favourite of mine. 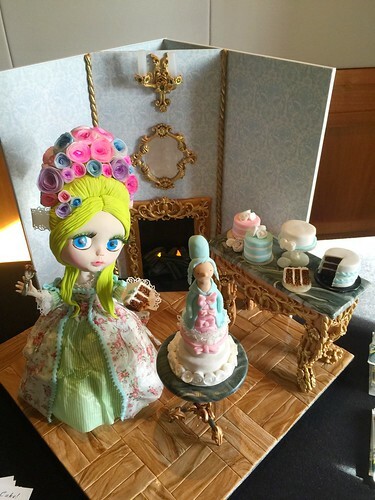 As the MC remarked when this Blythe doll riff on the Dolly Varden cake by professional baker Cakicature went to auction, this work of art in cake form looks like something out of a Tim Burton movie. 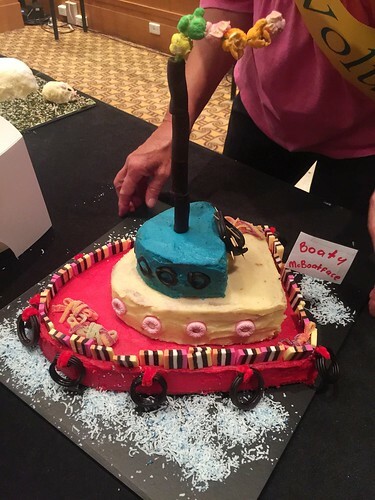 Love the meta-ness of a cake in which a Dolly Varden is making her own Dolly Varden cake. 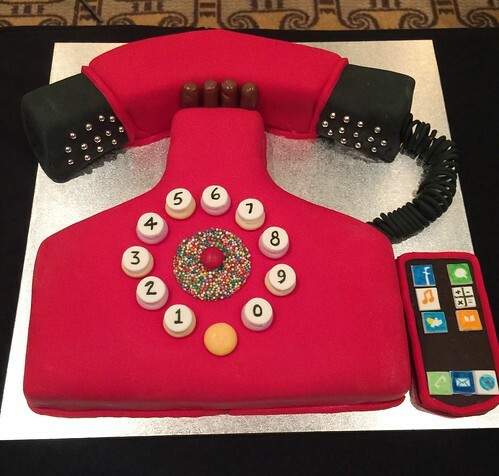 Cakeception! 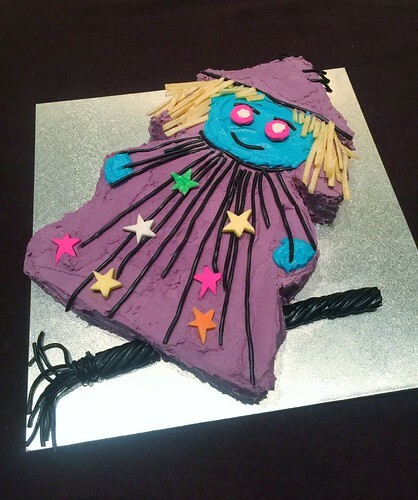 My other favourite cake from the professional bakers was this friendly witch. Talk about impressive feat of structural engineering! 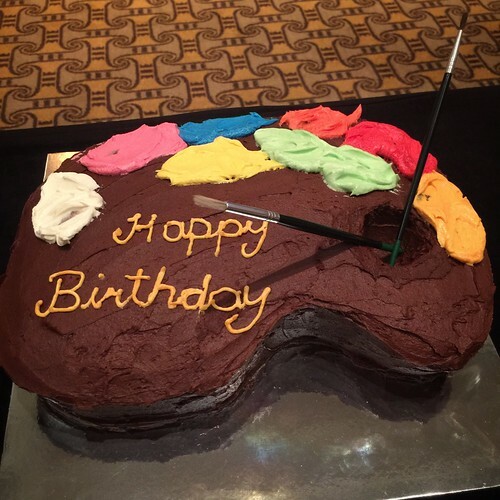 I've no idea how you get a cake to Wingardium Leviosa like that, but I suspect witchcraft was involved. 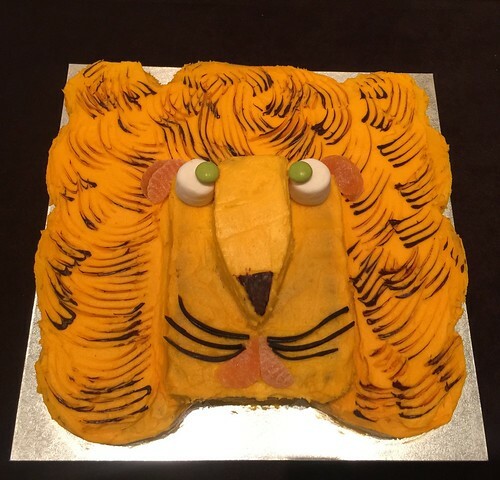 Ten points to Gryffindor, Surrender to Cake. 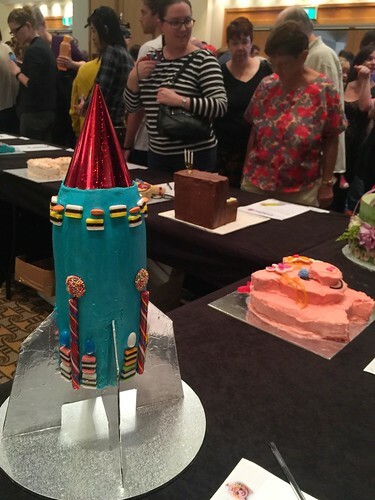 I realised that if I wanted to bid on a cake and transport it back to Melbourne, I'd need a cake with a low centre of gravity. 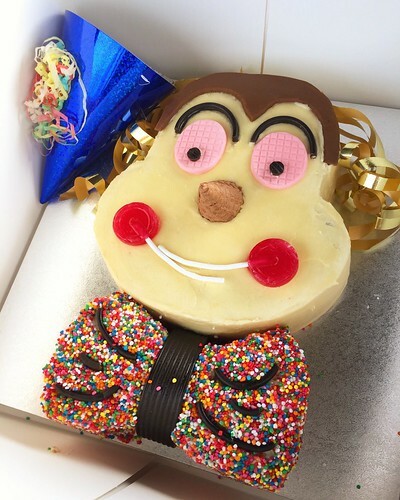 Ultimately I was successful in the silent auction and secured the happy clown cake, a design I'd always loved because of the bendy lollipops forming his mouth and rouged cheeks. The following morning he had an adventure going through the baggage scanner at Canberra Airport, much to the amusement of airport security staff, but was given the all clear to fly to Melbourne for Mother's Day. Thanks for reading! 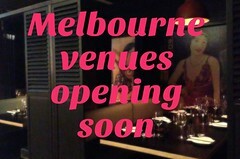 And to those of you who used to read Melbourne Gastronome, thank you so much for your readership and comments over the years. 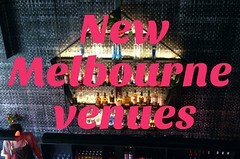 While the blog has retired, I still do the odd bit of freelance reviewing and you can sometimes find me babbling about restaurants I visit around town on my @mutemonkey Instagram account. Props for the subtle Harry reference! I really enjoyed seeing your photos and reading the accompanying text. 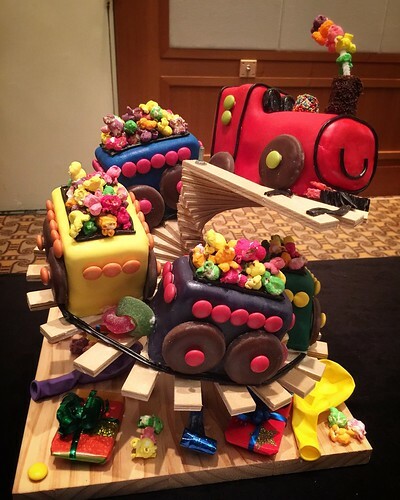 Lovely memories of bygone cakes and birthday parties and small smiling faces. 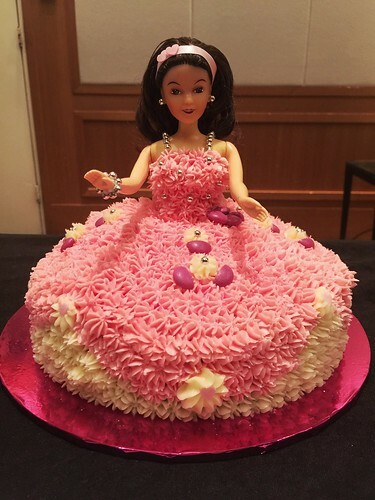 I sent the link to a couple of dozen friends who too would have been baking such cakes for their children in the 80s and 90s and I have received some nostalgic emails re their experiences and memories. 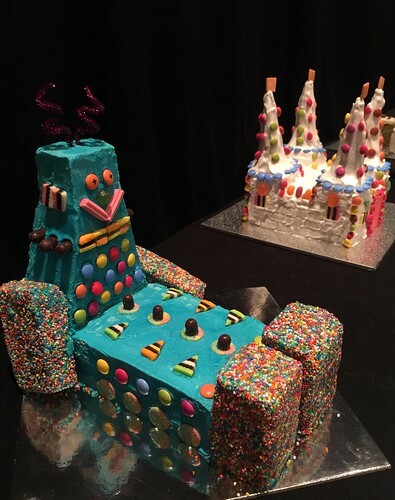 But I have so say that although your 6th birthday castle cake was quite spectacular, it nearly killed me! 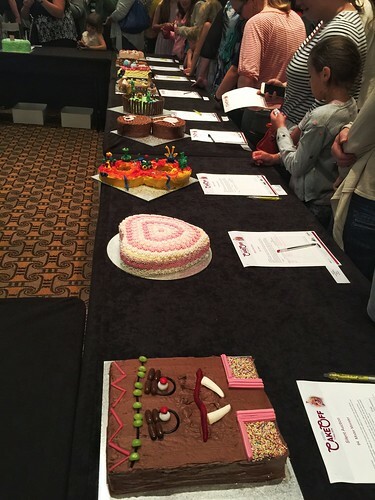 This is the greatest blog post of the year... thank you SO much for taking photos of all these, sitting in the kitchen as a little person looking at that cookbook is such a fond memory for me!